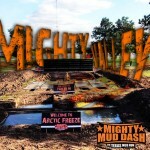 What is Mighty Mud Dash? 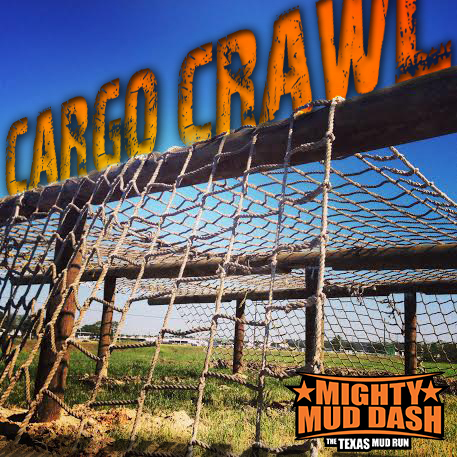 Mighty Mud Dash events are 5K (3.2 mile) mud run obstacle courses equipped to challenge and test your strength, stamina, and ability to work as a team. The actual distance varies depending on each event. With over 40,000 participants locally along with the latest in superior obstacle development, the Mighty Mud Dash is the premier Texas obstacle course series! To learn more, click on the “Obstacles” tab above and also check out the “Kids Course” tab for the younger ones. Please note that the course is subject to change. Over, Under – Here you will be expected to leap over 3 to 4-ft tall hurdles and under 2-ft. tall ones. if you try to ‘cheat’ and go over an obstacle you are supposed to go under, you will be met by some barbed wire. Dark Knight – There will be multiple trenches cut 3ft wide and 20 ft long. Each trench will be filled half way with water and covered by 4X8 sheets of plywood. If you are scared of the dark…this is not your obstacle. Barb Wire Bear Crawls – Exiting the Dark Night you will be met with your first Mud Pit, but you must stay low, like under 2 ft low, as barbed wire will be right above you. Tube Tunnels – There will be four to five corrugated pipes laid at a slight angle leading into a mud pit. As you gain access to the pit below you will be met by water as it proceeds to enter the tunnel. As you exit into the pit you will be fenced in by 6 fence panels laid over top of a watery mud pit. Rubber Bandit – Welcome to tire heaven. Here you will do 20 yards of high knees through tires, then you will run through 40-60 swinging tires. 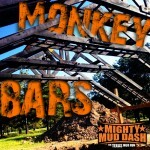 Lumber Jacked – Where telephone poles, mud, and water combine. 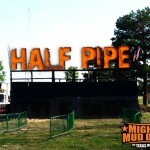 Here you will have to go through mud pits laced with telephone poles in each pit. As a participant you are supposed to go over and then under the telephone poles as you see fit. Life’s a Ditch - Welcome to our version of trenches. Here you will run through 20+ yards of trenches filled with 3ft of water. Please note that there will be a lip going in and a lip going out. Try not to slip in and be sure to help each other out. Hurdles in the Woods – After this obstacle you will make your way back in the woods where you will face three sets of tree hurdles. Spider Webs – as you venture your way out of the woods you will be mangled by hundreds of yards of bungee cords wrapped from tree limb to tree limb. Mud Moguls – The most deceiving obstacle, Mud Moguls is a stretch of 5-6 large mounds of dirt with 2-3ft of water in between each mound. Due to the water, mud, and steep angle of the mounds, it becomes extremely difficult to get up and over the moguls without slipping. Be sure to have helpers nearby. 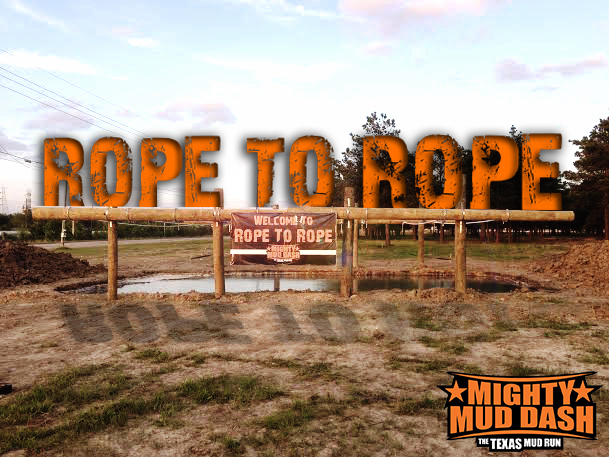 Rope to Rope – This obstacle is exactly as it sounds, it is a series of ropes tightly attached from one main beam to the next. 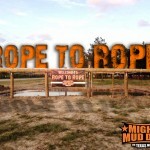 Ropes will cross a 14ft mud pit that is 4ft deep. You’ll either need killer upper body strength or be clever enough to use your whole body to shimmy across. 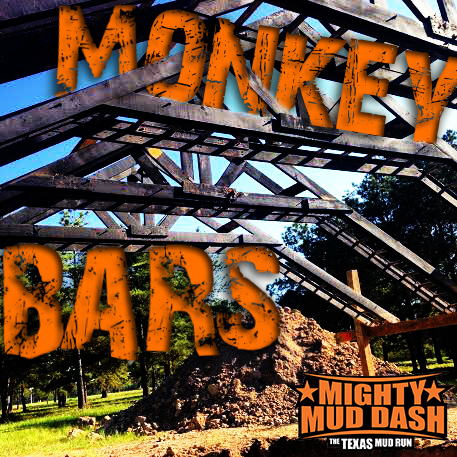 Monkey Wrench – Here you will try to conquer our monkey bars that are built on a truss system. You will start out at a slight incline with a deep pitch, then you will level out going across and then you finish at a declined angle. 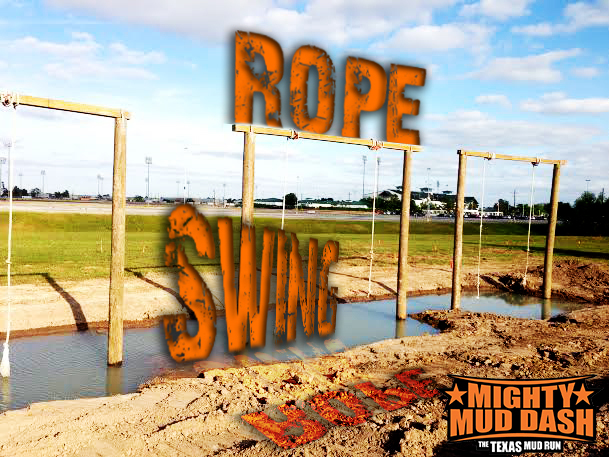 At the highest point you will be more than 10ft above a deep watery mud pit. Grip is essential here. Rope Swing – Fun, but a hard landing. 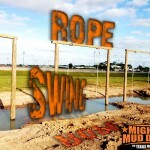 You will use a rope to swing across a mud pit, and if you don’t swing high enough, you will hit the water. If you DO conquer the rope swing and make it to the other side, then be sure and try to keep your footing on the wet mud incline. 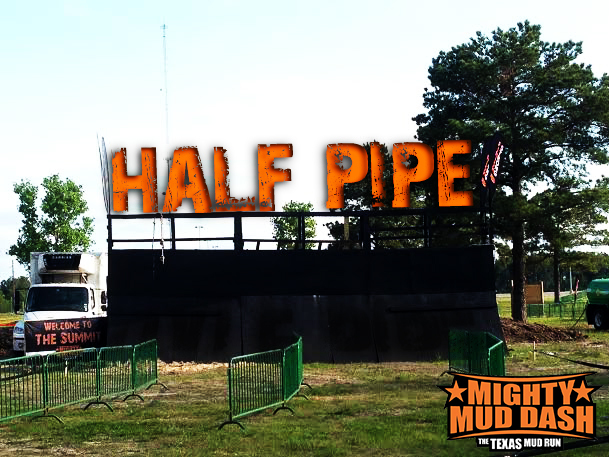 Mud Mountain -You will climb 20 ft to reach the top before you slide down in a watery mud pit. Ropes are attached to the mountain to help you climb up, but even so, it is very easy to slip. Wally World – Welcome to the start of Mighty Valley and the last stretch. Here, you will face the feat of conquering multiple 10-ft tall walls. The Summit – This is our version of the Half pipe. We will have ledges and ropes on two sides of the half pipe, but in the middle there will be no support for all you daring souls. Downfall – This massive waterside located at the top of the Summit sends participants sliding down a 45-degree-angle smooth slope, briefly airborne, and then finally splashing into a large pool of ice called the Arctic Freeze. Arctic Freeze – This is a 9-ft deep mud pit full of both water and 28,000 pounds of ice which is filled in throughout the day by our volunteers. Participants will be expected to jump in the pit via the “Downfall” slide and swim to the exit of the pit. Please note the pit will be difficult to exit, so if you have issues swimming there will be nearby lifeguards to help you out. Also, make sure to either keep a hold of or not bring any loose articles (glasses, action cameras, and hats) as they will likely be lost during the dive into the ice pool. 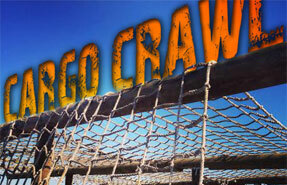 Cargo Crawl – You will go up across and down our cargo net. This isn’t your typical A-frame cargo crawl – it’s a bit more difficult than that. As each section will sag, you will be prone to rolling across making it extremely difficult to gain footing. Gopher Holes – Stay low as you go through the second round of barbed wire bear crawls – crawling under barbed wire just 2ft off the ground, and muddy water below. Fenced In – Here you will conquer 3ft deep trenches that have fence panels laid over the top. Each trench will be adequately filled nose-deep with water. It is easier for the participant to enter in backwards and then climb onto the fences to help pull themselves out. 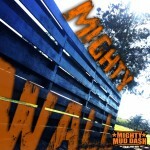 Mighty Wall – Spend the last bit of stamina you have by climbing over a 14-ft wall. Though it sounds simple, this is no easy task. As runners have already slipped, slid, swinged, and crawled through the mud, the Mighty Wall will inevitably become slippier and slippier with mud from other participants over time. Grab a hold – and hold on tight. 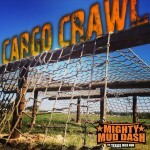 Mystery Obstacle – This can be placed anywhere in the course. 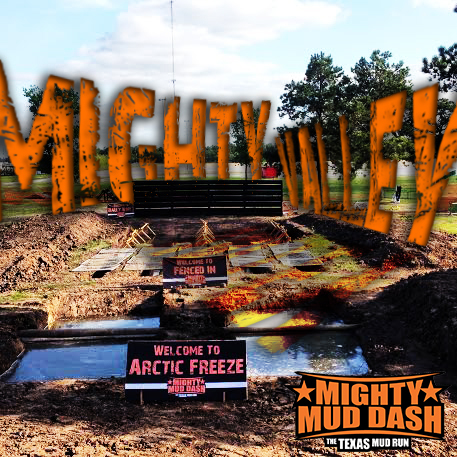 Mighty Mud Dash is no longer limited to just adults! 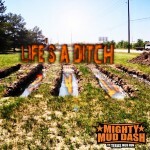 Now your kids can come join in on the fun with the Mighty Mud Dash 100 Yard Obstacle Dash! 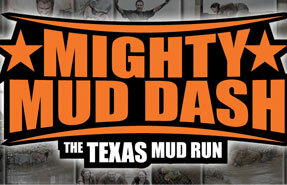 Your children can get the scaled down experience of what it means to be a Mighty Mud Dasher! The Kids Dash heats will go off between 9:30am-12:00pm. 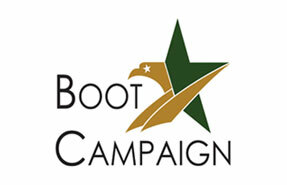 Registration will only be on the day of the event; there will be no pre-registration for the kids course. Ages 6-14. The kids dash is $20.00 for unlimited access, and includes a medal and youth T-shirt with purchase. All Adults must sign a parental consent form for their children. Must be at least 6 years of age. The Term heat is used loosely. No photographers on the course without permission. *Spotters will be present to run with the children to complete the course. *The Kids Dash is not chipped timed and there are no winners or losers – only Mighty Kids.